(San Antonio, Dec. 13, 2018) — Bernard Arulanandam, Jane and Roland Blumberg Professor in bioscience at UTSA and the university’s interim vice president for research, economic development, and knowledge enterprise, has been named a Fellow of the National Academy of Inventors (NAI). The honor recognizes Arulanandam for demonstrating a prolific spirit of innovation in creating and facilitating outstanding inventions that have made a tangible impact on quality of life, economic development and the welfare of society. 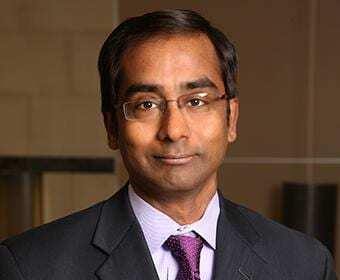 As Interim Vice President for Research, Economic Development, and Knowledge Enterprise, Arulanandam is leading the growth and advancement of UTSA as a research-intensive university, as identified by the National Research University Fund (NRUF) and Carnegie Commission on Higher Education. He has also made significant contributions in the field of microbiology as a researcher and faculty member. Arulanandam has published more than 100 peer-reviewed papers in microbiology and related fields and has received funding from numerous governmental and non-governmental agencies including the National Institutes of Health, the Department of Homeland Security and the Department of Defense (DOD). He has served as the director of the UTSA South Texas Center for Emerging Infectious Diseases (STCEID), one of the premier centers for the study of infectious diseases in the nation. The center’s focus is the origin and development of emerging and bio threat-related diseases. In that role, Arulanandam was instrumental in establishing the UTSA Center of Excellence in Infection Genomics, a program within the center that supports microbiology research, teaching and outreach activities aligned with the priorities of the U.S. Army. Infection genomics is the scientific discipline in which biologists characterize functions properties of the entire genome of infectious organisms. Active in the San Antonio community, Arulanandam is also a scientific director of the Vaccine Development Center of San Antonio, a partnership between UTSA, UT Health San Antonio, Southwest Research Institute and the Texas Biomedical Research Institute. Through the center, the partners collaborate on infectious disease research and vaccine development and promotion. In 2014, Arulanandam was named a Fellow of the American Association for the Advancement of Science. In 2017, he became a Fellow of the American Academy of Microbiology. He also received a 2016-17 Fulbright International Education Administrator Seminar award. He obtained his Ph.D. in microbiology and immunology from the Medical College of Ohio and an M.B.A. at UTSA. Arulanandam is the third UTSA faculty member inducted into the National Academy of Inventors. Eighmy was selected in 2013 and David Akopian in 2016. The rare honor places the trio among an elite group of researchers that includes presidents and senior leaders of research universities, Nobel laureates, National Inventors Hall of Fame inductees and National Academies members. He and 147 other members of the 2018 class with be inducted at the annual NAI meeting at Space Center Houston in April. With the election of the 2018 class, there are now more than 1,000 NAI Fellows, representing more than 250 research universities and government and non-profit research institutes. The 2018 Fellows are named inventors on nearly 4,000 issued U.S. patents, bringing the collective patents held by all NAI Fellows to more than 35,000 issued U.S. patents. The National Academy of Inventors is an industry organization comprising U.S. and international universities, and governmental and non-profit research institutes, with more than 4,000 individual inventor members and Fellows spanning more than 250 institutions worldwide. It was founded in 2010 at the University of South Florida to recognize and encourage inventors with patents issued from the U.S. Patent and Trademark Office, enhance the visibility of academic technology and innovation, encourage the disclosure of intellectual property, educate and mentor innovative students, and translate the inventions of its members to benefit society. The NAI publishes the multidisciplinary journal, Technology & Innovation.